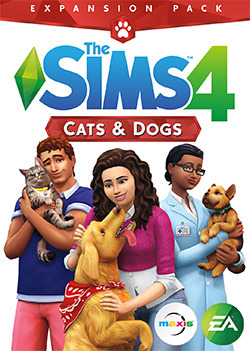 We all have been waiting for it, and now it’s here: The Sims 4 Cats & Dogs, the fourth Expansion Pack for The Sims 4! Cats and dogs are about to change your Sims’ lives forever as they become part of their households! Become a veterinarian and take care of pets in the neighbourhood. The all-new Create A Pet tool allows you to personalise cats and dogs. Choose their unique appearances, distinct behaviours and expressive outfits! As a veterinarian, you can treat animal ailments and run your own clinic in the brand new amazing coastal world: Brindleton Bay! Download The Sims 4 Cats & Dogs directly! Recommended price by Electronic Arts: $39,99/€39,99/£34,99. Check out our price overview below with trustworthy and cheap stores. This expansion pack is only available as the standard edition for PC and Mac. Download the game as a digital download! After you bought the game, you will receive a unique legal serial key (code) which enables you to download the game on Origin. After that, you can install the game and play it directly. The advantage of digital downloads is that you do not have to wait for the post delivery, and above all, it is cheaper!